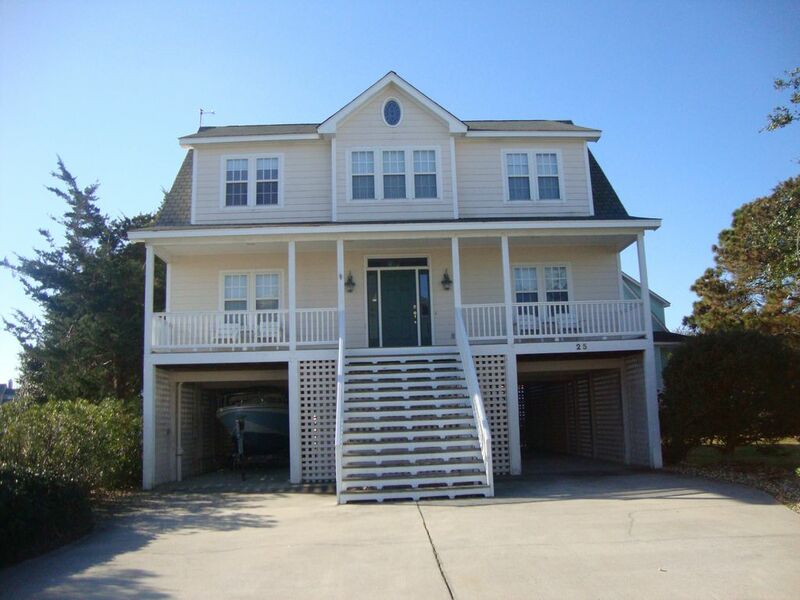 Experience what the Outer Banks has to offer while staying in this beautiful waterfront home. This home is located on the Manteo/Nags Head City limits. This 4 bedroom/3.5 bath home is located in Pirates Cove which is an exclusive and beautiful neighborhood. The first floor has the kitchen, living area, 1/2 bath, laundry room, and the master bedroom. The master bathroom has king size bed with a separate shower and a large jacuzzi garden tub. There is a queen sleeper sofa in the living area. There is also a gas fireplace and a deck with a gas grill and hot tub. The second floor has a large bonus room and another sun deck.There are three bedrooms and two bathrooms on this floor. Two bedrooms have king beds, and the other one double bed and one twin bed. There is a queen sleeper sofa in the bonus room. There is a community pool and hot tub located in walking distance of the house as well as a playground area with a basketball goal that is perfect for children. There are also tennis courts and a fitness center for those of you wishing to exercise. The home overlooks the beautiful waterfront and there is a 55' dock space available for your use which leads directly out to the sound. There is a boat ramp located directly across from Pirates Cove. The home is about one mile from the beach where you will find convenient parking for beach access. Be sure to bring your bikes. This is the perfect place to ride and enjoy the views. We have provided a few bikes for your use, also. The home is equipt for young children with a high chair, crib, and booster seat. Not to mention toys. There are 5 TV's and five DVD players. Spend your day fishing, walking on the beach or riding your bike through the neighborhood and over to Manteo. Be sure to walk over and see the fishing boats come in for the day and visit Manteo where the Queen Elizabeth II replica is located on the waterfront. In the evenings, enjoy a meal at one of our wonderful nearby restaurants come home and relax in the hot tub. There are 6 golf courses within 25 minutes, NC aquarium, 4 lighthouses, putt-putt, movie theaters, YMCA which now has a skate park, and plenty of shopping (including an outlet mall). Don't forget to visit Jockey's Ridge where you can learn to hang glide and visit the Wright Brother's Monument. This is a great family vacation home! There is a lot to do for everyone! No smoking - We are sorry, but this house does Not rent to College Students. I was fortunate to grow up on the Outer Banks. While it has developed and changed a lot since I was a kid, it still has maintained the charm and beauty is it known for. I am married and have two sons who are in college at NCSU and UNC. Yes, a house divided! We love the Outer Banks and we hope that when you visit, you will too! You would love the Outer Banks. There is so much to do and see for everyone! The Outer Banks is like no other beach you have been to. It is a beautiful beach and there are so many things to do but it is not so commercial that you feel like you need a vacation after your vacation. Having grown up here, I have a real love for the beach. Seeing the excitement on faces when they catch a fish for the first time or find a beautiful shell is priceless. Our home is set up with everything you could possibly need. When we built this home, we built it to suit our needs. It has a great bonus room upstairs that the kids love and since everyone always ends up in the kitchen, we made the downstairs living area open with the kitchen. When you walk in, you will feel like it is your own home. There are two bathrooms upstairs and 1 1/2 downstairs. There is a separate fitness center available for your use free of charge. We have quit a few bikes, but I cannot guarantee that they are fully functioning since I have renters using them. We have a very nice tennis courts that are available for your use free of charge. There are golf courses in the area that you can visit. If you pay via PayPal with Credit Card, you must add a $55 fee. This is the Paypal fee. Thank you. The inside of this house was very nice! The floors, the furniture and a well stocked kitchen were awesome! The hot tub was available. It is just a quick walk to the Marina to view some nice boats. We loved our visit and lots of good places to eat which was very close. We would definitely come back again. Thank you so much for taking the time to provide such a nice review. I really appreciate it and I am thrilled that you all had a nice time! I look forward to you all coming back! This home is amazing. Ample room, very clean, and nicely decorated/furnished. We enjoyed the property’s amenities which included a large pool, volley ball court, basketball court, children’s park. My extended family truly enjoyed everything about our stay. The owner was very accomodating and great with responses. We loved the hot tub and all of the grilling space. Bikes were great to have there, the community pool was nice. We loved our family time here and can’t wait to come back again! Property was excellent. The view and boat slip were perfect. Would definitely recommend this owner and cottage. Thank you so much! So glad you all had fun! We had a lovely week staying at Fran's home. The house is clean and the layout is nice for families. The kitchen is well stocked. There at baby gates, bed rails, a high chair and even a cozy coupe. Plenty of parking. Outside outlets to charge a golf cart for this cart friendly gates community. Hot tub and grills on deck. Pool, gym and restaurant access. We had a wonderful time and will be back again! If paying 50% down now is going to cause a financial hardship, please let me know and we will work out a plan. Your $200 rental deposit is completely refundable upon your departure providing there is no damage, the trash is taken out and the dishes are done when you leave. I have NEVER had to keep a deposit and I am not planning on keeping yours!